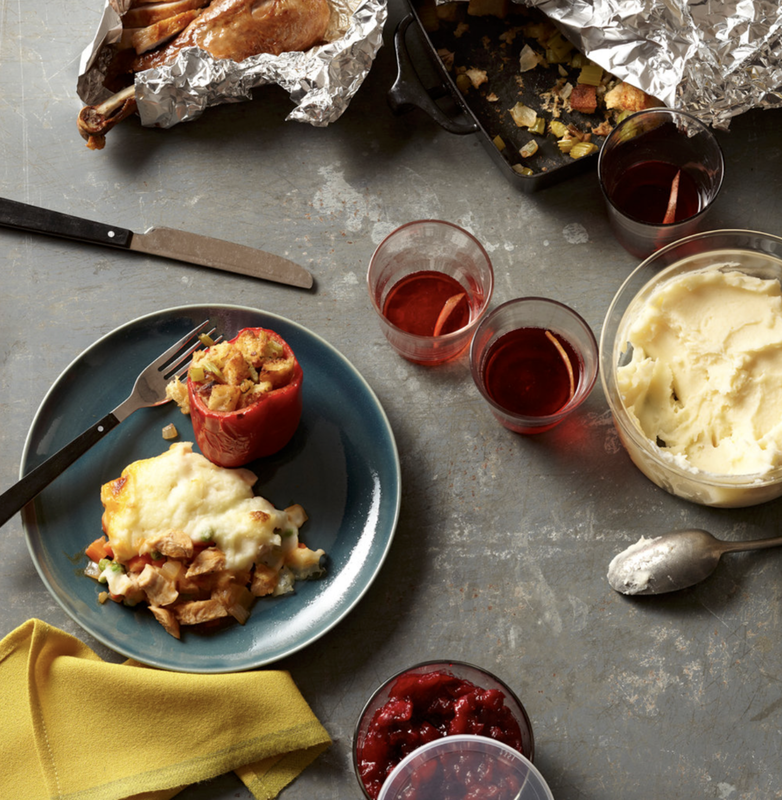 Seven years ago, I published a piece in the Times Magazine called “A Radical Rethinking of Thanksgiving Leftovers.” It’s a list of mini recipes (somewhere between ideas and full-on instructions) for what to do with the four Thanksgiving leftovers that many of us are most likely to have lying around come Friday: turkey, stuffing, mashed potatoes, and cranberry sauce. It remains my favorite collection of Thanksgiving leftover recipes that I’ve done and, rather than re-jigger the whole thing, I’ve turned it into the equivalent of an album with bonus tracks. Version 2.0 (below) includes all of the original recipe ideas, many of which have been updated to weave in different ingredients and flavor profiles, along with a handful of recipes that were (due to space restrictions) left on the cutting room floor. Of course, your leftovers may not match these exactly, but there’s enough variety here for you to find at least a few things that will work for what you’ve got on hand. At the very least, consider these “recipes” as a way to stimulate your imagination past the point of the requisite next-day sandwiches. Cook chopped onion, carrot, celery, garlic and ginger in neutral oil until soft, then add chicken or turkey stock, and a few pieces of whole star anise, and bring to a boil. Cook udon or soba noodles in boiling salted water until almost done; drain and stir them into the soup, along with shredded turkey; heat through, and discard the star anise before serving. Garnish: Scallions. Toss shredded turkey with chopped scallions, celery and cilantro. Fold in mayonnaise, some finely chopped canned chipotle in adobo to taste, and some toasted pumpkin seeds if you like. Garnish: Cilantro. Cook chopped onion, carrot and celery in butter until soft. Add a sprinkle of curry powder or garam masala and cook until fragrant. Add lentils, a bay leaf and turkey or other stock, and a splash of coconut milk to cover. Bring to a boil; turn the heat to low and cook, stirring occasionally, until the lentils are tender. Stir in chopped turkey and heat through. Garnish: Fresh mint. Whisk together ketchup and hoisin sauce (about a half cup of each), a splash of rice-wine vinegar, Chinese five-spice, minced ginger and garlic and some cranberry sauce if you like; add enough water to form a thin sauce. Cook over medium-low heat for 10 minutes, then stir in a pound of shredded turkey and heat through. Serve on toasted hamburger buns or rolls with some shredded cabbage, sliced scallions, or cilantro. Spread shredded turkey in a single layer on a baking sheet (it’s okay if the pieces aren’t super small; include some skin if you can). Toss with any neutral oil, salt, cumin, coriander and/or chili powder. Broil until the edges begin to sizzle and crisp, a few minutes; serve with corn tortillas and the usual taco garnishes. Cook sliced onion in olive oil until soft. Stir in short-grain white rice and a pinch of saffron (optional; also optional: cumin and pimento). Nestle turkey into the rice (if you have bone-in pieces, use those). Add chicken or turkey stock to cover by an inch and bring to a boil. Simmer, covered, until the liquid is absorbed and the rice is tender. Garnish: parsley and lemon wedges. Pack a layer of stuffing into the bottom of a well-greased baking dish or ramekins. (If you have time for a layer of caramelized onions or sautéed mushrooms, even better.) Make indentations and crack eggs into them; sprinkle with grated Parmesan or fontina cheese and bake at 375 until the eggs are just set, 10-15 minutes. Cut the tops off a few bell peppers and remove the seeds and stems. Pack a mixture of moist stuffing (add any flavorful liquid, if necessary); grated Jack cheese; and ground beef or pork sautéed with garlic, cumin, and pimentón into the peppers. Drizzle all over with olive oil and roast at 450 until the peppers are tender, about 30 minutes. Toss portobello mushroom caps with olive oil and roast at 400°F until tender. Toss stuffing with crumbled blue cheese. Fill each cap with a thin layer of the stuffing mixture and broil until crisp. Heat milk, a few tablespoons butter and some chopped fresh sage, rosemary, and/or thyme until the butter melts. Beat one egg per two cups of stuffing, then slowly whisk in the milk mixture. Pour over crumbled stuffing, sprinkle a heavy amount of shredded Gruyère or cheddar on top, and bake in an 8-by-8-inch dish at 350 until browned and bubbly, about 50 minutes. For every 2 cups of crumbled stuffing, stir in 2 beaten eggs and a little flour. Form into patties and cook in olive oil or butter until browned on both sides. Sauce: Whisk together equal parts sour cream and cranberry sauce. In a bowl combine stuffing, ground pork or turkey, chopped fresh sage and fennel seed. Form into patties, then cook in olive oil until the outsides are crisp and the inside is no longer pink. Garnish: Maple syrup, cranberry sauce, or a mixture of the two. Cook chopped onion and garlic in butter until soft; stir into mashed potatoes. Fill wonton skins with a spoonful of the potato mixture (don’t overstuff); fold over and seal the edges with a little water. Working in batches, sauté in butter, steam, or fry in an inch or two of hot oil until golden brown. Garnish: Sour cream and chopped dill. Cook chopped onion, garlic and jalapeños in olive oil until soft. Stir into mashed potatoes and pack into a greased baking dish. Sprinkle with shredded cheddar and bread crumbs and drizzle with olive oil. Bake at 375 until browned and bubbly, about 15 minutes. Cook lots of chopped garlic and rosemary in olive oil until fragrant. Stir into mashed potatoes along with beaten eggs (about 1 for every 2 cups of potatoes) and enough all-purpose flour to bind. Form into patties (chill if time allows), then dredge in bread crumbs or flour and cook in olive oil until browned. Stir together mashed potatoes, chopped cooked turkey, chopped onion, beaten egg (about 1 per cup) and enough all-purpose flour to bind. (A little sage or thyme is good, too.) Roll into balls and dredge first in flour, then in beaten eggs, then in bread crumbs. Cook in olive oil until browned all over. Serve with cranberry sauce or applesauce and sour cream. Cook chopped onion and carrot in butter or olive oil until soft. Stir in a little tomato paste, chopped cooked turkey, peas or other leftover vegetables, and leftover gravy (or a spoonful or 2 of flour and some chicken stock); simmer until thick. Put the turkey mixture in a baking dish, spread mashed potatoes over the top, then top with crumbled stuffing or bread crumbs and a drizzle of olive oil or melted butter. Bake at 400 until golden brown. Garnish: Chopped parsley or sage. Spoon some mashed potatoes into greased muffin tins and make a well in the center for filling. Fill with chopped turkey, roasted vegetables, meats, fish, stuffing, or pretty much any other leftovers you might have in your fridge. Spoon some more potatoes on top to enclose the filling. Brush with olive oil and bake at 400°F until golden brown. Garnish: lemon wedges. In individual glasses, alternate layers of cranberry sauce, Greek yogurt, honey and granola, or chopped pecans. Garnish: Fresh mint. Combine 2 cups flour, 1 cup sugar, 1 1/2 teaspoons baking powder, 1/2 teaspoon baking soda and 1 teaspoon salt in a food processor. Pulse in 4 tablespoons chilled butter. Add 3/4 cup buttermilk, 1 tablespoon orange zest and 1 egg and pulse just until combined. Pour into a greased loaf pan and swirl in 1 cup cranberry sauce with a knife. Bake at 350 until a toothpick inserted into the middle comes out clean, at least 45 minutes. Spread cranberry sauce on a slice of bread. Top with sliced Gruyère and a second slice of bread. Butter the outside of the sandwich generously. Cook in a skillet until the bread is golden brown and the cheese is melted. Cook chicken parts in butter, rotating and turning as necessary, until browned on all sides; remove from the pan. Add chopped onion, garlic and ginger and cook until soft; stir in some cumin, cinnamon, and coriander, and cook until fragment. Stir in cranberry sauce and a little chicken or turkey stock or red wine; add the chicken. Cover and cook over medium-low heat, turning the chicken occasionally until it’s cooked through. Garnish: Orange zest. Cook chopped onion and garlic in olive oil until soft; add rinsed quinoa and stir until the grains are glossy. Add a minced canned chipotle chili, cranberry sauce, and water or stock to cover by about an inch. Bring to a boil, cover, and cook until the liquid is absorbed and the quinoa is tender. Toss in crumbled queso fresco and chopped scallions. Mix equal parts gin, Campari, vermouth and cranberry sauce in a cocktail shaker with ice. Shake and strain. Garnish: Orange or lemon peel.